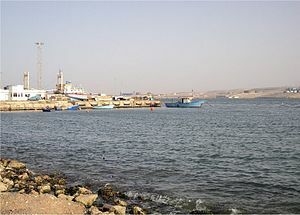 Tobruk or Tubruq /tɵˈbrʊk/ (Arabic: طبرق‎ Ţubruq; an aw transliteratit as Tóbruch, Tobruch, Ţubruq, Tobruck an Tubruk) is a ceety, seaport, an peninsulae on Libie's eastren Mediterranean coast, near the border wi Egyp. It is the caipital o the Butnan Destrict an haes a population o 120,000 (2011 est.). Tobruk wis the steid o a colony o auncient Greeks, an, later, o a Roman fortress guardin the frontier o Cyrenaica. Ower the centuries, Tobruk an aw served as a waystation alang the coastal caravan route. Bi 1911, Tobruk haed become an Italian military post, but durin Warld War II, Allied forces, mainly the Australie 6t Diveesion, teuk Tobruk on 22 Januar 1941. The Australie 9t Diveesion ("The Rats o Tobruk") pulled back tae Tobruk tae avoid encirclement efter actions at Er Regima an Mechili an reached Tobruk on 9 Aprile 1941 whaur prolonged fedhtin against German forces follaed. Rebuilt efter Warld War II, Tobruk wis later expandit durin the 1960s tae include a port terminal linked bi an ile pipeline tae the Sarir ile field. This page wis last eeditit on 9 Mairch 2013, at 17:22.